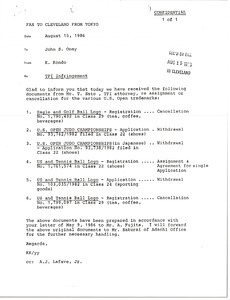 126 results found for: subject:"Trademarks"
Oney writes regarding the United States Golf Association and Tele Planning International trademark issue. 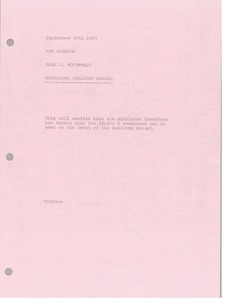 He sends a fax regarding the T. P. I. United States Open trademark infringements. 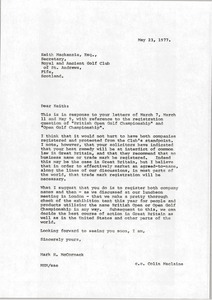 Replying to earlier letters from Mackenzie concerning the registering of the "British Open Championship" and "Open Golf Championship". 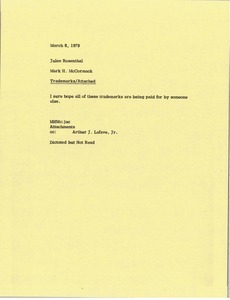 McCormack comments on the current situation and recommends registering the trade mark for both names. A thorough check of tents at the exhibition tents for use of the names is suggested followed by a meeting to discuss the matter in Great Britain and the United States. 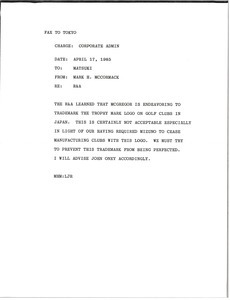 McCormack writes regarding the Royal and Ancient Golf Club of St. Andrews and McGregor trying to trademark the trophy logo on golf clubs in Japan. 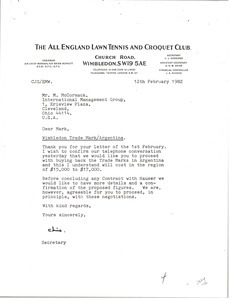 Wimbledon (London, England) - Gorringe confirms that they would like to proceed with buying back the Trade Marks in Argentina. Confirming that the Wimbledon committee has agreed that the Flying W trademark can be used on the front of the Kellwood Annual. Kondo writes regarding the Tele Planning International United States Open trademark infringements. 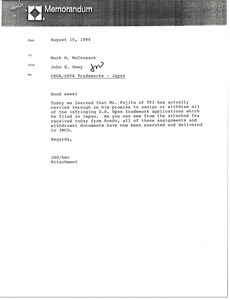 McCormack sends a memorandum regarding the United States Golf Association and Tele Planning International trademark issue. 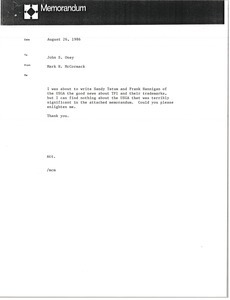 Enclosing an item and commenting on who is paying for the trademarks. Enclosure not with memorandum. 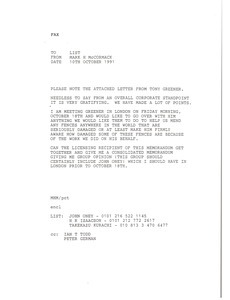 Concerning the attached letter from Tony Greener, thanking IMG for their help with the Gleneagles trademark matter. 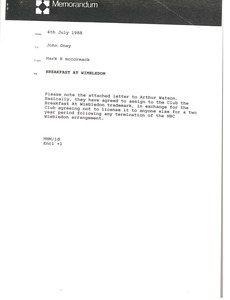 Concerning the attached letter to Arthur Watson regarding "Breakfast at Wimbledon."